Without THIS it doesn't matter how much marketing you do... - Coach & Grow R.I.C.H. …if you don’t increase your “Profit Mojo” first? Your Profit Mojo is how you think, feel and relate to making money through your business. In other words… it’s all about your INNER GAME. When I look back at my years in business the most profitable ones were the years when I intentionally focused on my profitability inner game. The cool thing is it doesn’t have to take a lot of time or effort to start pumping up your Profit Mojo. 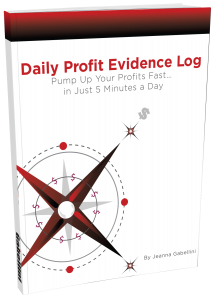 In fact, what if I told you that you could radically and consistently increase your profits in only 5 minutes a day? Not really. Check this out. It’s a super simple yet extremely effective free template created by my close friend Jeanna Gabellini that has the power to radically increase your profit-making mojo. Yup. It can. And it does. Get your profit-pumping template now. Here’s to cranking up your profit-making mojo! Skeptical about whether one little template can make such a big difference? That’s okay. Sometimes it’s hard to believe you can get what you want in a way that’s fun and easy. But what have you got to lose? Go get that template and let yourself be amazed.